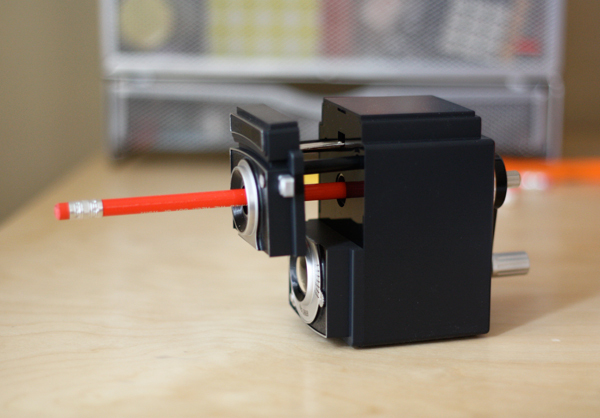 I just bought a pencil sharpener that looks like a camera. I keep buying and throwing out cheap little sharpeners that break my pencil leads off, and the one I have that actually grinds nicely requires three hands to operate it. The suction-cup bottom that holds it to the desk won't stick, so I practically need to hire an intern to hold it down so I can turn the crank. Electric models are too big, ugly, and seem like overkill, so don't even suggest them to me. But THIS little number, in addition to looking pleasing on my office shelf, actually works. It has a clever mechanism for clamping the pencil in place, and then you hold the box down with one hand and turn the crank with the other. A little drawer full of shavings pulls out at the bottom. I adore it. It's made by Kikkerland; you can grab one at Amazon. Oh, for cute! If I hadn't recently bought a new sharpener (which works fine... so far), I'd put one of those on my Christmas list. Hey, it's never too early to start wishing, right? Besides, it looks VERY much like Christmas outside right now. Ugh. I have this and it does work great! Looks good for my office table, where can i buy it. The link is in the post; you can find it at Amazon. I'm a bit baffled by this : "...it has a clever mechanism for clamping the pencil in place, and then you hold the box down with one hand and turn the crank with the other. A little drawer full of shavings pulls out at the bottom." Aren't desktop manual sharpener suppose to work like this? I am a pencil snob and finding a good pencil sharpener is a must. I had an electric sharpener at work/school and it died too early. At home, I have an electric that I picked up at a yard sale and it is the best; a Panasonic. I hope it will live a long life, it is old school, Made in Japan. I also have some old manual sharpeners that are battered but work great. My advice-look to yard sales and thrift shops. It is maddening to buy something new that doesn't work properly from the beginning. So many of the items from China are junk...cheap yes, but not worth buying. I have this pencil sharpener too and it's great. If you pull out the top section all the way when you sharpen, you get such a pointy tip! It's excellent! Best office supply...ever. This will be on my next Amazon order to put my total over $25 for free shipping! Anyone else do that? The free shipping is a great excuse to get something I want with something I need, justified by the fact that I'd rather pay for merchandise than shipping- it's a better value. Thanks for sharing this awesome gadget! Tambem adorei seu blog, o pdf de laço, super legal. Hello! I liked Your blog! I'm pretty sure my office needs this. I'm not big on using pencils but now and again I feel this pull to switch up and use them. Too bad I hate writing with pencils. I would love one of these! This almost makes me want to start. This type of pencil sharpener is definitely the best--I still have the one I got in Korea over twenty years ago when I was a kid (it's shaped like a little house and mysteriously has bunny holding a tennis racket on the front, but whatever). It still works great, and I will be super sad if it ever bites the dust. I don't blame you. It sounds great! 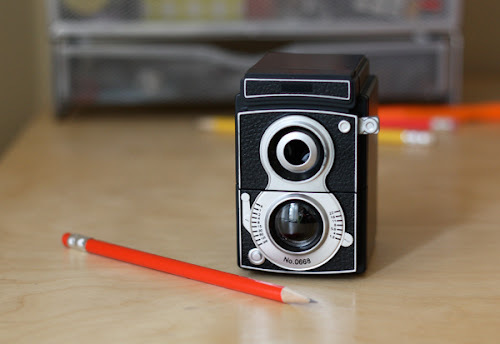 Wow, pencil sharpener like that is now a quite rare in my country, beautiful share btw. It's absolutely adorable! Then again Kikkerland have loads of pretty awesome looking items, I was quite tempted to get the heart pixel mug.